07:45 Good morning everyone and welcome to AUTOSPORT Live as we begin a new story - round six of this year's FIA Formula 1 world championship - the Monaco Grand Prix from the famous Monte Carlo streets. The series arrives at the principality with Fernando Alonso on the crest of a wave after a wonderful victory a fortnight ago in front of his own fans, and the Spaniard will be keen to kick on round the tight and twisting 3.340km Monaco street circuit and build a strong championship challenge. Red Bull may have the lead in both points tables at the moment, but the team will have to defend the onslaught of Lotus and Ferrari over the next few weeks and months - particularly in light of the tyres merry-go-round of the last 10 days. As far as today is concerned, it is situation normal. The teams will have two 90-minute sessions in which to make sure the cars function properly, perform various tests and then set to work on set-up and tyre durability. 07:51 Weather conditions have been rather disconcerting across much of Europe over the past couple of weeks for the time of year - including just down the road in Nice where two days of the local ATP tennis tournament have already been affected this week - but for Formula 1 things are set to start off on a positive note. It is dry and sunny with abundant blue skies and this will continue through both 90-minute sessions today, with a light southerly breeze and air temperature climbing to 21 degrees Celsius later on. 07:54 Tyres remain the talk of the sport at the moment, with Pirelli's stickiest possible allocation of soft and super soft rubber available for this classic street challenge. With a super-smooth surface and low-speed corners, tyre degradation is relatively limited here, but a couple of pitstops can still be expected from each driver on Sunday. 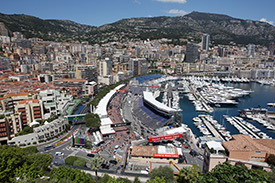 Despite the previous race in Spain being won from lower down the grid than ever before, qualifying position remains a vital part of the Monaco weekend. Hamilton, for one, is confident that he could hold back a train of cars on Sunday if he can use Mercedes' one-lap speed to secure pole. 07:57 Track temperature is up at 32 degrees Celsius with a couple of minutes to go until the start of the session. 07:59 Mark Webber is belted into his RB9 and the Australian is close to ready for an installation run when the track opens. 0 min: Esteban Gutierrez and Nico Hulkenberg are our first men out on track. 2 min: Sutil and Bottas head out to check over the condition of their machines. 2 min: Maldonado, di Resta and Ricciardo follow them out for an installation run. 3 min: Sutil has continued round into a second tour in the Force India. 4 min: Webber and Vergne are also on the circuit for a checking run. 4 min: Sergio Perez, Jenson Button and now Fernando Alonso are also out on track. 5 min: Perez and Button continue onto a second tour, but Alonso heads back in after his installation lap. 5 min: Sutil brings his car in, while team-mate di Resta also works through a second lap of the tight and twisting Monaco circuit. 6 min: Sutil trundles through the pitlane and back out onto the track to begin his third lap of the morning. 6 min: Button and Perez don't complete their flyers though - they're pushed back into the McLaren garage, and we're still yet to see a time posted in FP1. 6 min: Rosberg has just completed his installation, leaving team-mate Hamilton and Vettel as two of the last remaining drivers to get out there today. 8 min: Sutil pits after that third lap. Di Resta mirrors the plan and is back in again after a trio of checking laps. 8 min: Rosberg and Hamilton have toured through the pits and they are working through a second lap, before bringing their cars in again. 10 min: As Hamilton is wheeled into the smallest garage space of the season, silence falls over the circuit. 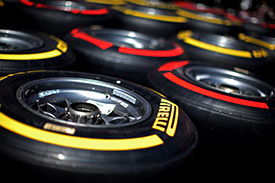 11 min: A reminder that Pirelli has brought the supersoft and soft tyres for this weekend's Monaco Grand Prix. Lewis Hamilton said yesterday that he was confident he could hold the field off from pole on the tight street circuit - read it here. 14 min: Sergio Perez breaks the silence as he heads back out for McLaren, boasting new front and rear wings this weekend. 16 min: Perez comes round for a second lap, potentially the first flying lap of the weekend. He's (predictably) purple in sector one. 17 min: It's not to be - Perez dives back into the pits at the end of that second lap, and the track is silent once more. 18 min: Webber is standing in the garage, overalls wrapped round his waist, and watching the monitors. 19 min: It is a similar story along most of the pitlane, as teams finish off the data download following the installation run and wait for track conditions to improve. 22 min: In a rare twist, temperatures are dropping. Ambient is now 22 degrees, while the track has dipped to 30 Celsius. 22 min: Mark Webber doesn't exactly have a bad history on the streets of Monte Carlo. Speaking to the media yesterday he urged Formula 1 to rethink its balance between show and racing, saying it 'wasn't right' that drivers like Lewis Hamilton could be lapped at Barcelona, having been part of the lead pack in the opening laps. Read it here. 22 min: Hamilton wanders out the back of the Mercedes garage, as the team continues with routine checks to both his and team-mate Rosberg's car. 23 min: Still quiet on track - Nico Hulkenberg has even had time to give an interview to Sky Germany. 23 min: Rosberg is clearly hungry, as he munches on a banana at the Mercedes pit gantry. A healthy breakfast for the German. 24 min: Bottas gets ready and climbs aboard the Williams. The Finn is strapped into the car, ahead of a run on the circuit. 26 min: While nothing is happening on the circuit, Paul di Resta is taking the opportunity to clean his helmet visor, as he sits on a tool chest. 28 min: Alonso might not be massively busy right now, but he's been very active since arriving in Monaco. 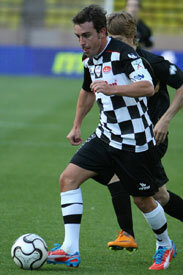 On Tuesday the two-time world champion played in the annual Monaco World Stars football match (pictured). He then sat down with the media to express his view that Red Bull has had it too easy of late, and that its tyre complaints aresimply the result of it not being able to handle defeat well. Read his full argument here. 31 min: Jean-Eric Vergne has climbed aboard the Toro Rosso and is being strapped in, with more drivers looking to head out for a run shortly. 31 min: McLaren and Ferrari's drivers clamber into their respective cockpits. It's not quite cars on track, but we'll take it. 31 min: But there is no move from Vettel, who is quite happy thank-you very much in his regular tool chest sitting position. 33 min: Esteban Gutierrez breaks the impasse and heads out for Sauber. 34 min: Ricciardo joins the Mexican on track. 35 min: 35 minutes into practice, and we've had a collective 35 laps from the field - none of them as yet timed. Gutierrez is onto his second lap now though, so that could (fingers crossed) change. 36 min: Ricciardo is into his first flying lap of the weekend. 36 min: We have our first timed lap of the weekend - a 1m29.219s from Gutierrez. 36 min: Vergne joins his Toro Rosso team-mate on track. 37 min: Ricciardo is quicker than Gutierrez out of the box with a time of 1m24.466s. 37 min: @OfficialSF1Team: "#Guti is out on track. Another lap of radio checks and then the usual Friday morning run." 38 min: Gutierrrez and Ricciardo trading blows - the Sauber man moves back ahead with a 1m24.130s. 38 min: Ricciardo retakes the top spot from Gutierrez with a lap of 1m22.825s. 38 min: Nico Hulkenberg and Charles Pic have now joined the fray. 39 min: Vergne is now into his first timed lap of the weekend and will join the fun soon. 39 min: Advantage Gutierrez again - 1m21.984s puts him back on top. 39 min: Ricciardo again moves ahead of the Sauber driver with a time of 1m21.493s. 39 min: For reference, Fernando Alonso worked his way down to a 1m16.265s in FP1 last year. 40 min: Vergne completes a slow lap which was likely an aerodynamic test in 1m37.110s. 40 min: Moments later, Gutierrez reclaims top spot with a 1m19.770s. Hulkenberg comes round for his first flyer, a 1m22.809s. 41 min: Ricciardo continues trading the fastest lap with Gutierrez and moves ahead with 1m19.753s. 41 min: Felipe Massa begins his first flyer (hopefully at least) for Ferrari, and he's already purple in the first sector. 41 min: Button is also out for McLaren. 41 min: Bottas has joined the circuit for a run in the Williams. 42 min: Massa backs up his pace with a purple second sector, and sure enough goes fastest with a 1m18.818s. 42 min: Ricciardo improves his time but remains second to Massa with 1m19.075s. 42 min: Button's first flyer meanwhile was a 1m21.423s. 42 min: Giedo van der Garde and now Kimi Raikkonen have joined the fray. 43 min: Vergne has now set some representative times and is seventh with 1m24.999s. His pace will continue to improve. 44 min: Rosberg and Hamilton are now on track for Mercedes. 44 min: Raikkonen jumps to sixth with a 1m21.812s, as Massa sets a new overall best in sector one. 45 min: And Massa does indeed lower the benchmark further, dropping down to a 1m17.685s despite being slightly held up by Guteirrez's Sauber. 45 min: Webber is now on the circuit, as the Mercedes pair move into a timed lap. 46 min: Plenty of green in the timesheets now. Alonso sets three personal bests to come round in a 1m20.179s. 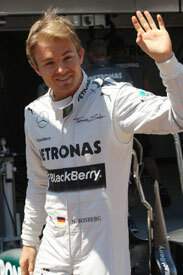 46 min: Rosberg completes his first effort in a slow and steady 1m22.883s. He is 11th. 46 min: Button jumps up to second with a 1m18.976s, some 1.2s down on Massa. 47 min: Vettel finally joins the circuit in the other Red Bull, as Hamilton completes a slow first timed lap and slots into 15th. 47 min: Speaking of the Brazilian, his policy of one rapid lap and several slow seems to be working - he's lowered the sector one benchmark once more. 47 min: Rosberg continues on for another lap and surges to the front with 1m17.005s. 47 min: Webber is up to seventh with a time of 1m19.650s. 48 min: Hamilton moves up the list to fourth spot with a time of 1m17.990s. 48 min: Massa falls short of demoting Rosberg, but the German's time at the top is still short-lived as Alonso surges to the top with a 1m16.842s. 50 min: Massa dives into the pits just as Max Chilton catches him - the Marussia man has to stamp on the brakes and does very well to avoid contact with the Ferrari, which was pretty much on the racing line. 50 min: Vettel completes a timed lap. It is a steady checking tour and he is 16th with 1m21.005s. 50 min: Rosberg is back to the front with 1m16.195s as the times continue to improve. 51 min: Vettel moves up the order to eighth place with 1m18.357s as he gets up to speed. 51 min: Alonso falls just 0.107s short of immediately bettering Rosberg's new time. Only three other drivers are within one second of Rosberg - Mark Webber in fifth is 1.7s down. 52 min: Romain Grosjean's third flyer - a 1m18.049s -lifts him to seventh. 52 min: Hamilton moves up one spot to third with a time of 1m16.803s, cutting the gap to 0.608s to his pace-setting team-mate. 53 min: Di Resta is out there and he completes his first timed lap of the weekend, moving into 18th with 1m20.483s. 54 min: Alonso joins Massa in the pits, his eight-lap run now complete. 54 min: Maldonado jumps up the list to fourth place in the Williams. His time is 1m16.993s. 55 min: Romain Grosjean runs straight on at the chicane, but with no barriers he's able to simply carry straight on and rejoin without drama. 56 min: New lap, similar error - Grosjean locks the rears and goes too deep again into the chicane, although this time he does manage to take the corner. 56 min: Rosberg's latest lap yielded no improvement after posting a fastest first sector. 1m16.433s was the ultimate result. 57 min: Vettel has been quietly getting on with it. He is up to seventh with 1m17.558s, but his latest effort did not bring an improvement. 58 min: Charles Pic and Max Chilton are currently propping up the top of the timesheets, although both men are within six tenths of a second of McLaren's Sergio Perez, who currently sits 20th. 58 min: So we have Rosberg leading Alonso by 0.107s, with Hamilton 0.608s back in third, Maldonado fourth and Massa fifth. 58 min: Scratch that - Perez vaults to ninth with a 1m17.975s. 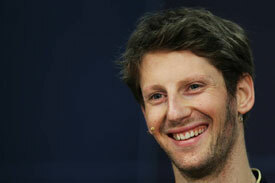 59 min: Grosjean also improves, as a 1m16.437s lifts him to third, behind only Rosberg and Alonso. 59 min: After that flyer, Grosjean pits for Lotus. 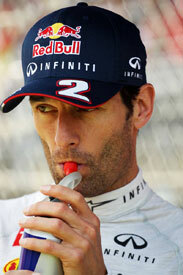 60 min: Webber - a two-time winner here - moves to sixth, 0.8s down on Rosberg. Team-mate Vettel, currently eighth, pits. 60 min: Di Resta and Sutil are on track for Force India. The Scot goes ninth quickest with 1m17.777s. 61 min: Charles Pic moves himself off the bottom two - a 1m19.829s is enough to jump Jean-Eric Vergne and move into 20th. 62 min: One lap later, Pic improves again. He's now 19th, as gains of around two tenths allow him to move ahead of Jules Bianchi. 64 min: Sutil was looking set to improve his position and move into the top 10, but the German lost three-tenths of a second in the final sector. 64 min: Alonso heads back out for Ferrari. He's the only man currently in the top eight on track right now. 66 min: Wonderful helmet camera shots from Bottas in the Williams, but then he struggles to get the car slowed down into the chicane and he is forced to cut the left-right section. 66 min: Jenson Button moves into that top eight group now with a 1m17.440s, some 1.2s down on Rosberg. 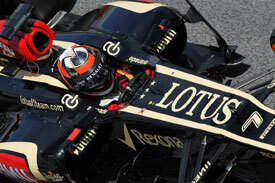 67 min: Grosjean's Lotus, currently in the pits, showing the tell-tale signs of barrier contact on his left front tyre. 68 min: Only five drivers out there at the moment, with the rest in for changes after what was a lengthy first meaningful run for many of them. 69 min: Button sets personal bests through the first two sectors...but while he does improve to a 1m17.140s, he stays eighth. 70 min: Rosberg is back out for another run on the same set of soft tyres. He continues to lead the pack with a time of 1m16.195s. 71 min: Nico Hulkenberg sets a new personal best in the first sector, but his lap trails off in the middle split and he stays 14th. 72 min: Jenson Button does the same, setting a new personal best over the opening split but losing time thereafter. 73 min: Gutierrez finds marginal gains to improve to a 1m18.875s. His Sauber is visibly bottoming out at points on the circuit. 74 min: Alonso is wheeled back into the Ferrari box. 74 min: Webber is back out for another run. He remains sixth in the classification. 74 min: Maldonado is still in the top five. He comes out and joins the racetrack to begin his second run. 75 min: Raikkonen too out on track. The Finn - who said yesterday he was in no hurry to sort a 2014 deal - currently sits 13th. 76 min: Hamilton heads back out for another run in the Mercedes, as Webber almost runs out of road at Ste. Devote. 77 min: Felipe Massa sets a new overall best in sector two, but he can't fully capitalise and moves into third, fractions behind Rosberg and Alonso. 77 min: Webber was able to just slow the RB9 down and take an extremely wide line through the first corner and get on his way up the hill. 78 min: Sutil heads out of the Force India garage and begins another run. He is 12th in the classification, three-tenths down on team-mate di Resta. 80 min: @MyCaterhamF1: "Lock up for @GvanderGarde on run 3 so he pits for another set of tyres for run 4." 80 min: Vettel finds two-tenths of a second but he is still down in ninth position with a best time of 1m17.380s. 80 min: Fernando Alonso moves onto his third, and what Ferrari says should be his final, run of FP1. 83 min: Almost the entire field out for the final eight minutes - only Vergne and Ricciardo are still in the pits now. 84 min: Max Chilton improves to a 1m20.225s but he stays stuck to the bottom of the timesheets, around half a second slower than Marussia team-mate Jules Bianchi. 86 min: Sutil then spins at Ste. Devote at the start of the next lap and he just glances the barrier, before coming to rest. 86 min: The German was able to get going again and has returned to the pits for checks. 88 min: Webber crosses the line three-tenths down on his best in this session and the Australian remains in seventh spot. 89 min: Di Resta manages a marginal improvement in the Force India and he is 12th with a time of 1m17.548s. 89 min: Raikkonen sets personal bests in sectors one and three and improves to a 1m17.509s. He can't break into the top 10 however. 89 min: Meanwhile team-mate Romain Grosjean jumps to third with a 1m16.380s. 09:30 The session has ended. Drivers already on a timed lap may complete it. 09:30 Grosjean nearly loses the rear at Ste. Devote, but is able to save it and continue. 09:30 Everyone is on track with the exception of Sutil after his minor ding with the barrier at Ste. Devote a few minutes ago. 09:31 Sutil has climbed out of the car as the team starts to work on sorting out his car in time for the second session. 09:32 As the yellow lights come on, drivers are now making their way to the grid for the traditional practice starts. 09:33 Nico Rosberg is fastest in first practice at Monaco with a best time of 1m16.195s, ahead of Fernando Alonso and Romain Grosjean. 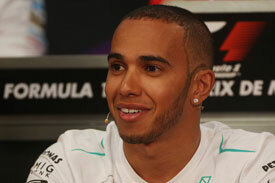 09:33 Massa is fourth with Hamilton fifth, Maldonado sixth, Webber seventh and Button in eighth spot. 09:34 Perez is ninth in the second McLaren and Vettel rounds out the top 10 for Red Bull after a busy first session in the principality. 09:35 So it's Mercedes on top for now, but will Rosberg stay there? Join us later for all the second practice action from Monaco.